Even in a culture marked by a growing secularism, millions of Americans still regard prayer as an important part of their lives. In fact, in May 2014 a Pew Research Center poll found that 55% of Americans pray daily. A much higher number – almost 90%- pray at least once a week. This doesn’t suggest that all of them pray as Christians or they all live godly lives. It does suggest, however, that there remains, in the minds and hearts of our neighbors and friends, a hunger for God, or a need for something spiritual, the world cannot offer. And while church attendance for decades in America has usually been considered stalled somewhere in the 40-45% range of the population, a majority of people still believe something about God, and they believe prayer is a way to Him. What do you think about prayer? How important is it in your life? Do you believe God hears and answers prayer? Even for those of us who want to pray and make prayer an even more important part of our lives, knowing how to pray and making time to pray can be obstacles we need to overcome. As a pastor, I have taught on prayer for years and written on it as well (see my web site, iprayaustin.com). One thing I might have done inadvertently, in my exuberance to encourage prayer, is over-emphasize the heroic examples of prayer. Of course we all need role models and there are some magnificent examples in history to draw from. Unfortunately, the examples of the extraordinary prayer warriors of the past might subtlety act as a de-incentive to the average Christian who wants a healthier and more consistent prayer life. How is that possible? Let’s say you are a University student, or a working mom or dad, or running your own business. Are you busy? Now suppose your pastor preaches a message next Sunday about prayer and he quotes Martin Luther who needed 3 hours a day for prayer each day. Or the pastor uses the example of David Brainerd, who spent hours everyday praying in the Colonial American wilderness, often in the snow of an open field, exacerbating his pre-existing illness, until he finally died at the young age of 29. Or perhaps you were at Hyde Park Baptist Church or The Quarries Church last week and heard my story of the late evangelist and author Jess Hendley. The man who found Jess Hendley that day is a friend of mine and he personally related that story to me in even more meticulous detail. The old Christian warrior had been in secret prayer for days! He had lost track of the time and even the day of the week! As a minister, I am motivated beyond words by that kind of devotion. I want to be a prayer warrior like that. Maybe you do to. Or, perhaps, you are that young working mom walking through the last few months of life exhausted with the demands of motherhood and a career. 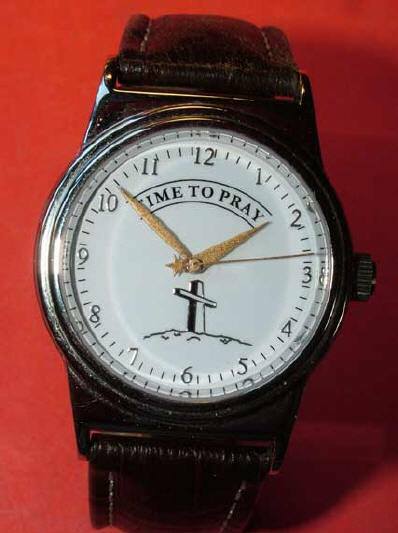 Do the stories of people spending hours and days in prayer motivate you? Or, is there a subtle message being conveyed- a message that seems to imply- “faithful prayer, like God requires, is out of reach for me”? THERE IS GREAT HOPE FOR YOU IN PRAYER! While we will always be impressed with the sincere devotion of exceptional men and women who linger in prayer for hours, most of us need to find other ways to pray in shorter blocks of time, while still remaining faithful and consistent. Perhaps the words of the late Adrian Rogers come closer to an experience we can emulate in our daily lives. He once said, “I’ve rarely spent two hours in prayer, but I’ve rarely gone two hours without prayer.” Does that seem more like what you could strive for as you improve in your desire to be faithful in daily prayer? Guilt is a powerful, but ultimately terrible motivation for the Christian life. Most of us could say, “I need to pray more.” That will almost always be true. But feeling you have failed before you even begin is worse! When I started my prayer life, more than 35 years ago, I had no idea how to pray- but I wanted to learn! My first attempts were commitments to pray 5 minutes a day. It started at that point- like a child’s first awkward steps, but I kept going and I grew from there. You may never spend hours a day in prayer. Few do. You can, however, accept God’s invitation each day to meet Him with the time you have and as you are faithful in that commitment, your appetite for prayer and commitment of time will inevitably increase. In any event, the goal of prayer is not watching the clock but knowing the Lord! Start where you are and let the Lord lead you from there! QUESTION: What will unlimited prayer look like? Persistence in prayer means you don’t give up- you keep praying even when answers are slow in coming or non-existent or even if things get worse- YOU KEEP PRAYING! QUESTION: What would your family be like if you knew each member was praying for you daily? What would God do through our church if each of us prayed for the Church and its mission everyday?